Gilden's Arts was founded in 1981 and is a family run business with representatives in the United Kingdom, Israel and the United States of America. In June 2006, we have opened our new gallery in Hampstead, north London. 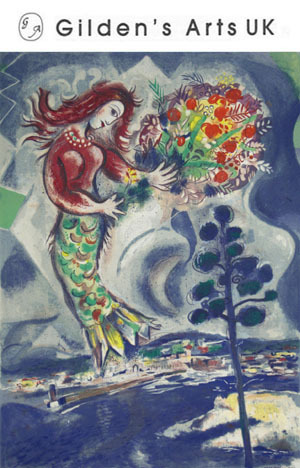 - Works on paper including original prints from the 20th Century: Our collection of International Art includes the Modern Masters such as Pablo Picasso, Marc Chagall, Joan Miro, Salvador Dali, Henri Matisse, George Braque, Moise Kisling, Max Ernst, Lesser Ury and many other highly acclaimed artists. - Ecole de Paris & Eastern European Art: We specialise in dealing with original works from the School of Paris (Ecole de Paris), with an expertise for works by Jewish artists who were part of this famous European movement. Therefore, we offer high quality works by acclaimed Hungarian, Polish and Russian artists who were part of the Ecole de Paris. - Israeli Art & Modern and Contemporary Art. We also offer knowledge and experience in the Israeli art market; paintings from some of the leading Israeli artists. Generally, we have a keen interest in works of art by artists from the following movements: Surrealism, Cubism, Impressionism, Post-Impressionism, Expressionism and Russian Avant-garde, as well as DADA and the Abstract movement. Gilden's Arts also represents Estate collections of oil paintings by Pincas Abramovich, Elyahu Sigard, Meir Steingold, Antal Biro, as well as works on paper by Arthur Markowich, Mihaly Von Munkacsy and Jozsef Bato. We work with both private collectors and institutions. Our gallery service includes fully documented research, a condition report and a certificate of authenticity for each work. The Directors and Staff at Gilden's Arts have a wide experience and significant knowledge of the International Art Market and we gladly advise clients and institutions on their collections.